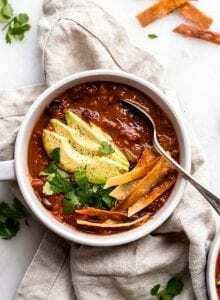 This vegan tortilla soup is easy to make in about 20 minutes with simple, everyday ingredients. It might just be the Best Vegan Tortilla Soup there is! Top it with avocado, lime, cilantro and tortilla strips for a comforting, healthy and absolutely delicious meal. Saute the onion, garlic and jalapeño in the olive oil for 5 minutes, stirring until soft and fragrant. Add the diced tomato, vegetable stock, tortilla, chili powder and garlic powder. Stir well and simmer over medium heat for 10 minutes. Stir in the black beans, cilantro and lime and simmer a few more minutes. Using an immersion blender or by placing most of the soup in a blender, blend just enough to ensure the tortilla has been blended completely into the soup. You want to leave it a little chunky. Serve topped with avocado, cilantro, fresh lime and crispy tortilla strips. To make crispy tortilla strips, cut 1/2-1 corn tortilla per person into approximately 1/4-1/2 inch strips. Fry the strips in a large pan with 1-2 tsp of olive oil over medium-high heat until browned and crispy. Flip and stir frequently to ensure they don’t burn. It took me about 10-12 minutes to get them nice and crispy. I also added a little salt and pepper to the pan for seasoning. Keep a close eye on them to prevent burning.